Paracetamol or acetaminophen USAN, is a widely used over-the-counter analgesic (pain reliever) and antipyretic (fever reducer). It is commonly used for the relief of headaches and other minor aches and pains and is a major ingredient in numerous cold and flu remedies. In combination with opioid analgesics, paracetamol can also be used in the management of more severe pain such as post-surgical pain and providing palliative care in advanced cancer patients. ●Muscle pain and Musculo skeletal pain. ●Arthritis. [Osteo & Rhumatoid Arthritis]. This tablet is the combination of Lornoxicam (Chlortenoxicam) and Paracetamol (Acetaminophen - Aniline Analgesics) and show rapid onset of action and provides rapid relief on all types of pain management. This tablet also contains excellent gastrointestinal tolerability & long term safety and useful as safest pain killer for High Risk groups patients like Hypertensive's, Cardiac Patients , Diabetics & Renal failure patients. Lornoxicam is new nonsteroidal anti-inflammatory drugs (NSAID) of the oxicam class with analgesic, anti-inflammatory and antipyretic properties and have 2000 times potent than Aspirin and 124 times more potency than Ibuprofen. It also ensures superior onset of action than Diclofenac and Aceclofenac. Lornoxicam differs from other oxicam compounds in its potent inhibition of prostaglandin biosynthesis, a property that explains the particularly pronounced efficacy of the drug whereas Paracetamol is a widely used time tested & time trusted over-the-counter analgesic (pain reliever) and antipyretic (fever reducer). It is commonly used for the relief of headaches, and other minor aches and pains and in major ingredients in numerous cold and flu remedies. In combination with opioid analgesics, Paracetamol could be used also in the management of more severe pain such as in post surgical pain and providing palliative care in advanced cancer patients. The onset of analgesia is approximately 11 minutes after oral administrator of Paracetamol, and its half life in 1 to 4 hours. Lornoxicam inhibits prostaglandin biosynthesis by blocking the enzyme Cyclo- oxygenase. Lornoxicam inhibits both isoforms in the same concentration range, that is, Balanced COX-1 Inhibition & COX-2 inhibition through that it's a safest pain killer. It is distinguished from established oxicams by a relatively short elimination half-life (3 to 5 hours), which may be advantageous from a tolerability standpoint. The absolute bioavailability of Lornoxicam is 90-100% and no first pass effect was observed. Paracetamol is usually classified along with nonsteroidal anti-inflammatory drugs (NSAID), Like all drugs of this class, its main mechanism of action is the inhibition of Cyclo oxygenase (COX). Paracetamol is a p-aminophenol derivative that exhibits analgesic and antipyretic activity. It does not possess anti-inflammatory activity. Paracetamol is thought to produce analgesia through a central inhibition of prostaglandin synthesis. Most of adverse reactions observed in clinical trials were of a mild and transient nature. 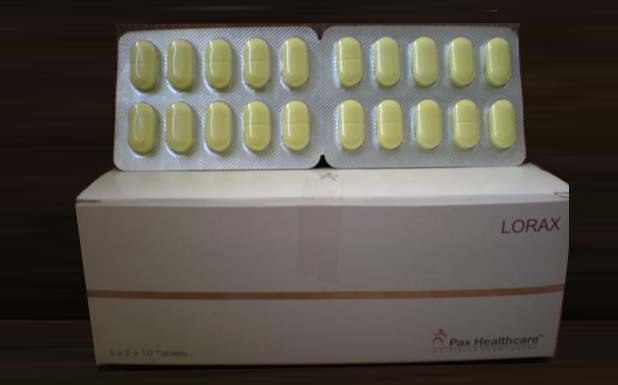 The most commonly seen adverse reactions in clinical trials of the tablet formulation were gastrointestinal and also adverse reaction have been reported for cephalosporin sensitive person and also in some cases somnolence, nasopharyngitis, fatigue, dry mouth and pharyngitis, and most were mild to moderate in intensity. This tablet is contraindicated in patients with peptic ulceration, salicylate sensitivity, gastrointestinal bleeding, severe renal and liver impairment; pregnancy and lactation. Increased Lornoxicam blood concentration was observed when given concomitantly with cimetidine. Enhanced effects of anticoagulants, sulfonylureas, methotrexate, ciclosporin, digoxin. Decreased effects of diuretics, ACE inhibitors.